No matter where you’re headed in your car, it’s never just in a straight line. This means you’ll need to steer your car through curves and turns along the way, requiring a fully operational and problem-free steering system for your safety. If the steering feels choppy or binds, if there’s unresponsive play in the steering wheel, or if you hear clunking, banging, or knocking when you make a turn, you should bring your car in for a steering repair for both hydraulics and modern electronic systems alike. New Concept Auto Service has performed precision steering repairs in Johnson County for 30 years. Our staff members are honest and friendly, providing our clients with the best customer experience possible while repairing steering system concerns on most makes and models. 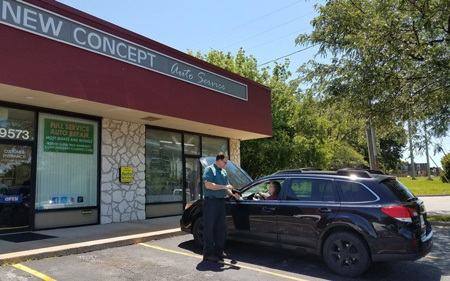 At New Concept Auto Service, we have your needs in mind. We won’t sell you unnecessary work, and we will always advise you of the required repairs in detail. You can rest assured that any steering repair we recommend is a necessary one. Our honest, ASE-certified master technicians have years of experience performing steering repair on most makes and models, from tie rod end replacement on your Ford Flex to rack and pinion replacement on your Nissan Altima. Of course you don’t want failed parts to keep you coming back in for the same reason. That’s why we always use original equipment and approved aftermarket parts for steering repairs at New Concept Auto Service. Honest. Accurate. New Concept. Call us or use our online appointment form to schedule your steering repairs today! At New Concept Auto Service, you can rest assured that an ASE-certified technician is working on your steering repair. We have the expertise and training to repair any concern that pops up, from fluid leaks to worn out parts. We perform steering repairs on all domestic and import models, regardless of the vehicle’s age. We have the necessary diagnostic tools and the repair technology to efficiently and accurately perform your steering repair right the first time. It can be inconvenient trying to coordinate your steering repairs around your school classes or work, so we work around your schedule to make your visit as hassle-free as possible.